This Menara review was made after playing the game nine times. We were sent a copy of this game by the publisher in exchange for an honest review. 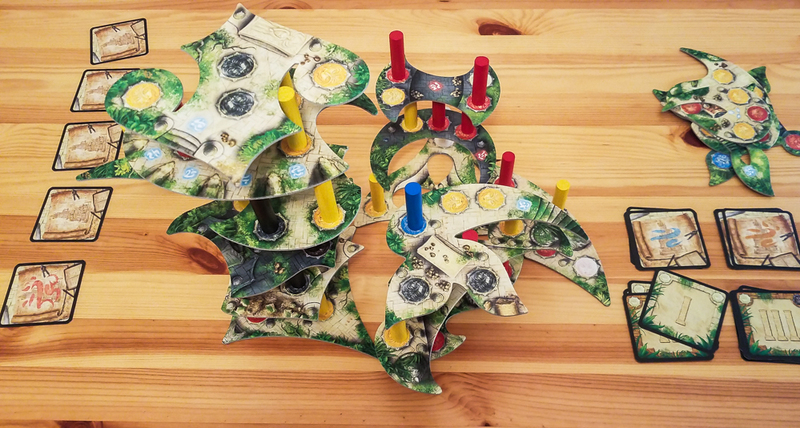 Menara is a cooperative dexterity game in which you’re attempting to reconstruct an ancient temple by building it up a certain number of levels. You’ll do so by placing columns on temple floors and hoping it doesn’t fall over before the game ends. Menara was designed by Oliver Richtberg and is published by Zoch Verlag. The goal in Menara is to have your temple built up to a certain level by the time the game ends. You’ll do this by looking at construction plan cards, placing or moving columns based on the images shown on those cards, and by adding additional floors to your temple. The amount of columns you’ll have each turn is based on the difficulty level you choose; the more columns you have, the easier the game is going to be. You’ll also start out with an easy, medium, or hard amount of temple levels that need to be built by the end of the game, though that can change as the game progresses. Each temple floor tile has a number of colored bases. Columns are always placed on their matching bases. Draw one construction plan card from any of the three decks. There are easy, medium, and difficult cards. Some cards simply have you place a specific number of columns anywhere on the temple, while others can have you completely fill in a temple floor or move columns from one level to another. Build by following the instructions on the construction plan card you revealed. Replenish your columns by drawing from the bag. When you place the last column on a temple floor, you’ll draw a new temple floor off of the stack and place it on top of columns or add it to the base of the temple. If you do place it on the base level, you’ll add the current construction plan card to the level cards to indicate that your temple has to be one level higher at the end of the game. You also add to the level cards whenever you can’t complete a construction plan card. You’ll lose the game if the temple ever collapses. 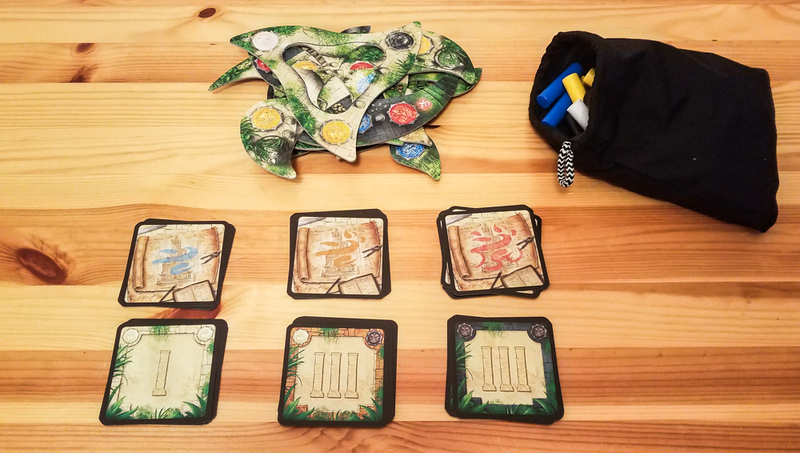 The game can also end when the current player can’t draw enough columns to have a full “hand,” if the last construction plan card is played, or when the last temple floor has been placed. When one of those three end-game conditions is met, you’ll win if your temple is as high as or higher than the number of level cards on the table. Easily the best thing about Menara is that every game plays out differently. You’ll have a different arrangement of temple floor tiles, the construction plan cards are randomized, and you only have so much control over the columns you end up having for your turns. All of that makes for an interesting and unique puzzle every time you play. I like that you not only have to reach your level goal but also maintain that level until one of the end-game conditions is met. It adds in an extra bit of tension that my group really enjoys. The tiles themselves are all uniquely shaped. It’s fun trying to come up with ways to make them fit on the temple you’re creating. It would probably be a pretty boring game if all of the tiles were the same shape. I think this theme is great. It’s a unique theme, which is always nice, and it’s easy to feel like you really are working together to rebuild this ancient temple. 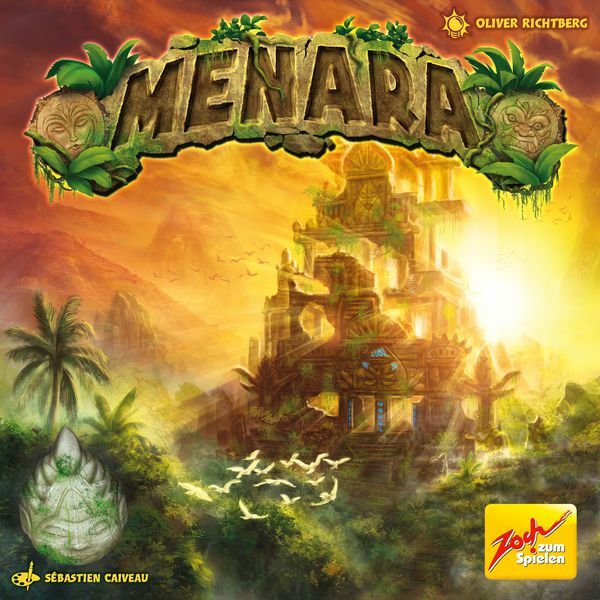 Menara is very challenging, but in a good way. Every time the tower collapses, you want to get everything cleaned up quickly so you can give it another shot. My group has only been able to win two of our first nine games (all on medium difficulty), but none of the losses have been too frustrating. Winning is very satisfying. The temples look really cool on the table once you’ve built them up a couple of levels. You will want to take pictures of your temples. Some rules aren’t completely clear. For example, it seems like you can keep placing columns even if you know a construction card is going to fail, but there isn’t a definitive rule for that in the rulebook. I wish there were one or two more ways for players to interact in this game. Some one-time-use player powers or even a rule that allows players to trade columns would have been great. This is not the type of game you want to get if you have shaky hands. I felt really bad for one person I was playing with because he had a very tough time placing the temple floors. That can ruin the experience for some people. Menara is so much more than just another stacking game. It’s tough to beat, there are plenty of interesting strategic decisions that need to be made, and it has a great look to it. I’m pretty bad at this game, but I’ve had a really good time playing it each time it’s hit the table. Menara is staying on my shelf because there aren’t that many good co-op dexterity games out there yet and it’s a unique experience. If you enjoy playing dexterity games, chances are you will be a fan of Menara. It works equally well as a family game and as a nice change-of-pace game for adult gaming groups, so plenty of people will get a kick out of this one. UPDATE: Menara made it onto our Best Cooperative Board Games of 2018 list! Thanks for taking the time to read our Menara review! To stay updated on all things cooperative board games, follow us on Twitter, Facebook, or via RSS.